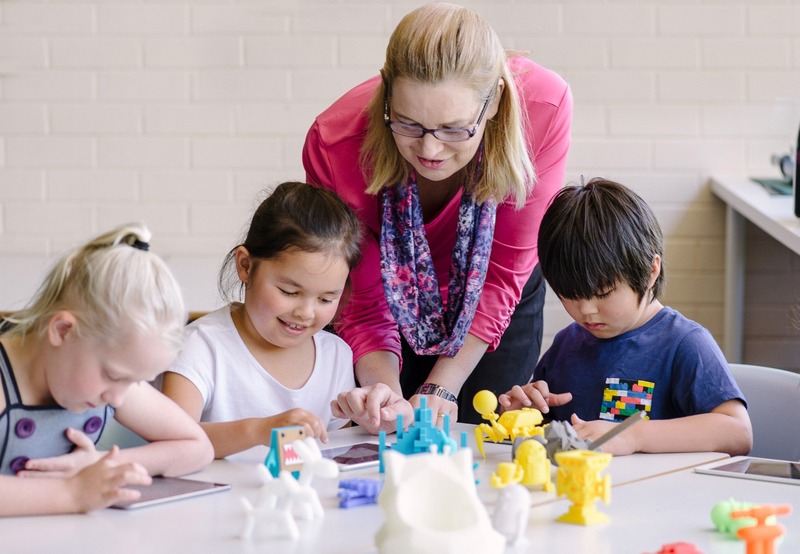 Access a range of resources to support their learning and develop confidence with 3D design and printing tools. Learning sessions can be tweaked, but depending on needs can vary from 1-4+ days of live PD with a blend of online sessions as well. Sessions can be mixed or separated for middle and elementary schools. Here is a sample of the content included in the training sessions. By the end teachers will be able to successfully integrate design thinking pedagogies into the classroom, and create their own lessons. What is constructionist learning theory? Unpacking the 8 big ideas of maker pedagogy? What are the benefits for including making and maker pedagogies in our teaching and learning? What are some examples of maker pedagogy in action? How do we integrate making into our STEM teaching and learning? Where does making fit in the curriculum? What is a maker-space and how do we set one up? 6.4.2 Presenter introduces constructivist learning theory developed by Seymour Papert and the underpinning 8 big ideas of maker pedagogy. Participants work in groups to unpack each of the 8 ideas by identifying examples in their own practice and questions/discussion topics they have about each idea. Participants complete a personal reflection of each of the 8 key ideas in relation to their own current practice and use this to frame personal learning goals. Present provides some video examples of maker pedagogy in the classroom. Presenter presents some examples of maker spaces. Participants begin planning maker spaces for their own classroom or school. Where does design thinking fit in the curriculum? 6.4.2 Participants what design thinking means to them. Presenter shows a video of students using design thinking processes to solve a problem and participants record observations. Presenter introduces model for design thinking cycle and participants work in groups to discuss and map their observations to the stages of the design thinking cycle. Participants work through a design thinking experience led by the presenter. The experience introduces strategies that can be used in the classroom for each stage of the design thinking cycle. Participants plan and give each other feedback on design thinking activities and strategies for their own students. What are the current and emerging applications of 3D printing? Participants share current knowledge and understanding of 3D printing. Presenter shares examples of 3D printing being used in the primary classroom and participants discuss the educational benefits. Presenter introduces 10 potential benefits for integrating 3D design and printing into primary classrooms using the design thinking cycle. Participants discuss and identify strategies for incorporating 3D technologies into teaching and learning. They identify possible issues and suggest solutions. 6.4.2 Participants work through introductory activities using Makers Empire 3D design software, led by presenter. Participants design tasks to introduce 3D design to their students. Presenter shares information about the role ‘learning by doing’ plays in constructionist learning theory in terms of students actively constructing their own knowledge and understanding by building on what they already know, can do and understand. Participants discuss different strategies for finding out and building on what students bring to a learning task. 7.4.2 Participants upload and share their favourite strategies for finding out students’ prior knowledge, skills, experiences and attitudes to Edmodo group. Participants respond to each other’s ideas in Edmodo and participate in online discussion. 6.4.2 Presenter leads participants through an exercise to demonstrate the capacity 3D design software has to allow students to create in ways they wouldn’t be able to without the technology. Participants share their reflections on the experience and discuss how they might use this in the classroom. 7.4.2 Participants design a making task for their students using 3D technologies to add value to students’ making activities. Participants upload their tasks and give each other feedback. Participants identify and discuss strategies for increasing the challenge or ‘intellectual’ stretch in a making activity. 6.4.2 Participants review the task they designed in online activity #2 and make changes to the task to make it more challenging for students’ thinking. They upload their re-worked task to EdModo and explain how they have increased the challenge of the task. 6.4.2 Presenter facilitates an online discussion about using the design thinking cycle to explicitly teach students how to learn through problem solving, critical and creative thinking and design. Participants identify and share explicit strategies for supporting students in each stage of the design thinking cycle and commit to test at least one with their class. Participants try the strategies identified in Live Webinar #4 with their students. They reflect on the experience and upload their reflections to the EdModo group. 6.4.2 Presenter leads an online discussion about the role time management plays in maker pedagogy and how teachers can support students to manage their time. 6.4.2 Participants design a resource (scaffold, poster, template etc.) to support students to manage their time within a making task and upload the resource to the EdModo group. 6.4.2 Presenter shares information about the role of failure in learning and Carol Dweck’s Growth Mindset research. Participants discuss and reflect on times in their personal or professional life, where failure has led to learning. Participants create and upload a list of their top ten questions or comments they could model or say to students during making activities to promote growth mindsets and the value of failure in learning. 6.4.2 Presenter facilitates a discussion about teachers modelling themselves as learners alongside their students. Participants design a lesson where they explicitly plan to model their own learning alongside students in a 3D making activity. 6.4.2 Participants complete and upload their lesson plan that includes an explicit plan to model their own learning alongside students. 6.4.2 Presenter facilitates a discussion about students’ participating in an online design community with other students in their class, school or beyond. Participants discuss policies, protocols, safety and other issues for students to participate in online activities. 6.4.2 Participants plan a lesson where students share their 3D designs with others in a safe environment and respond to the designs of others. 7.4.2 Participants attend an event where they present their students’ work and their own learning to the group. They give and receive feedback from others and celebrate their learning throughout the course. The focus is on maker pedagogy and design thinking using 3D technology. Teachers understand the concept and background of additive manufacturing. Determining what can be translated from 3D design to printing. Best use in the classroom / Maker Space. How do you use 3D printing in the local classroom. Looking at real world classroom examples across different grade levels, subjects and integrating across different technologies.